Peter Paul Rubens, 1577-1640, one of the Netherlands’s famous artists in art history fled from Flanders to Germany with his family escaping Spanish religious protestant persecution. He later returned to Flanders at the age of ten, and became a devout Catholic. Rubens trained under local master artists and became a master himself in 1598. Because Flanders was still under the influence of Spain; artists were able to rely on commissions sponsored by the Catholic Church and the State. Peter Paul Rubens studied Renaissance art in Italy eight years after becoming a master. Returning to Flanders taking care of family business, Rubens received a Regency appointment to become the court painter. He improved his art career through government contacts receiving commissions from private patrons as well. One of Peter Paul Ruben's famous paintings in art history, "The Raising of the Cross", a triptych, was painted in 1609-10. The influence of Italian art is immediately recognizable in Ruben’s Michelangelesque, heroically strong, muscular bodies. His figures release tremendous power, pulling, lifting and straining to the edge of their ability raising the cross. Dramatic tension rises with the immediacy of the moment. High contrast lighting dramatically focuses on the central figure of Jesus Christ, a characteristic tendency used by Caravaggio. Also Caravaggesque is the strong diagonal artistic composition. Led through the painting artistically by Rubens, the viewer’s eye comes into the painting on the left side drawn to the high contrast lighting of Christ's body, just as a person reads a book. The eye then follows the length of Christ's body to the straining foreshortened figure near the bottom of the painting raising the cross with all his might. Finally our eye comes back again to the head Christ via the figure and rope on the right. Peter Paul Rubens shows his Flemish art realist abilities rendering the armor worn by the soldier to the left of Christ and in the articulated foliage along the top right of the painting. A similar triptych, with a reverse diagonal art composition is "The Descent from the Cross"1611-14.The painting is darker than "The Raising of the Cross" with stronger, contrasting light played on the Christ figure, similar again to Caravaggio. The figures are less energetic and the composition more organized. The emotional drama is toned down in sympathy for the dead Christ figure. 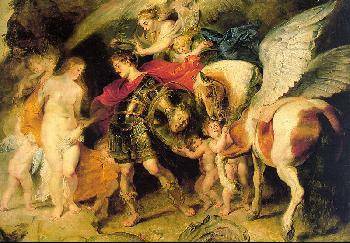 Another of Ruben’s famous paintings is "St. George and the Dragon", painted in 1606-10.This painting has characteristics of a new art style invented by Peter Paul Rubens, called "Baroque" art. A well-muscled, highly active, heroic figure caught up in a dramatic moment, violently killing a ferocious dragon atop a rearing horse. Peter Paul Rubens art continues the violent, active, dramatic theme in "The Hippopotamus Hunt", 1615-16.This time there seems to be a direct reference to Leonardo's "Battle of Anghiari", 1503-6. In both paintings there is sublime action, man against nature to the Death, full of dramatic action and excitement. The art composition of "The Hippopotamus Hunt" is a backward "s". The viewer’s eye comes into the painting on the upper left and follows through to the rearing horse on the right. It then goes back down through the hippopotamus to the white dog, the man with a knife, ending up following the fallen body to the right edge of the painting. Peter Paul Rubens softened his style toward the end of his career. In 1638 he painted one of his famous paintings in art history The Garden of Love", after rediscovering a painting by Titian. "The Garden of Love", is a reminder of Titian's "Bacchanal", 1518. Rubens' figures are not the classical style of Titian, but are actually contemporary figures of the day intermixed with grounded and flying cupids. The theme "Garden of Love" was a tradition of Northern art painting since the early 1400's, and now Rubens combines this theme with Titian's classical mythology creating a new genre. Other famous artists of the Baroque art period are Anthony van Dyck and Caravaggio. To view the entire gallery of Peter Paul Rubens paintings, click here.